January 2019 - Sunshine Drama School - Creative Drama Classes in Karori, Wellington. 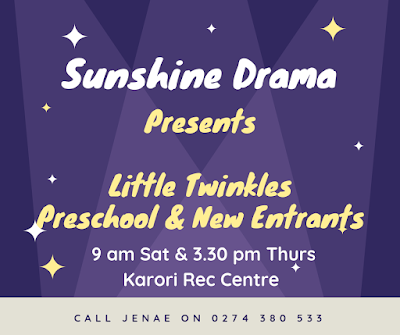 Sunshine Drama offers a class just for little ones aged between 4 -5.5 years. Classes engage and challenge young imaginations in a fun and creative learning environment. Together we explore stories and characters through movement, voice, role play, dressing up and props! Classes integrate brain-gym activities, have a weekly phonics focus and support children to extend their ever-growing vocabularies. Teamwork, social skills and developing confidence with self-expression is key to our curriculum. Little Twinkles runs Thursday afternoons 3.30 - 4 pm and Saturday mornings 9 am -9.30 am during term time. To discuss our classes or to arrange a free trial session, please contact Jenae on 0274 380 533. Sunshine Drama students take the spotlight! A huge congratulations to all Sunshine Drama Students for their hard work and dedication that they put into the rehearsal process for our end of term performances! I was really proud of the kids who did a fantastic job presenting to family and friends. Last term we had four performances on the go! Our Starbursts (5 year olds) took their own spin on the classic kids picture book ‘Dear Zoo’. Together we workshopped how this might look and who the characters might be! This was a great chance for the kids to have their first opportunity to work with a script and develop a colourful bunch of characters. The Sunbeams (6-7 year olds) took on ‘The Three Little Pigs.’ The children presented their lines confidently on stage. The script involved listening to and following many detailed stage directions which made the play action packed for the audience! It was all magical for our Flares performance! (8-10 years). The devised script ‘Enchanted Trouble’ set in ‘Sparkle Dust Woods’, was so much fun to workshop, developing a captivating storyline. A wide range of quirky characters was created including unicorns, princesses, dragons and of course ‘Spike’ the helpful hedgehog. Dragons Salty and Hot Pepper are after Princess Lily and Lucy’s special unicorn recipe book so they can become the best chocolate makers in the land! Unicorns Sherbert and Glitter help intercept the great recipe robbery! This script was a super challenge for this group of actors, who moved effortlessly between their characterisation and narration lines - two roles each in the play. Students were very committed and enthusiastic about the performance and this shone through in their confident performance! With our older group, the Supernovas (11-13 years), we had an epically, fabulous devised piece to present - ‘Pandemonium at the Theatre!’ Again so much fun and enjoyment was had developing this ‘sit on the edge of your seat’ play! One Saturday afternoon a group of friends decides to catch a movie. Little did they know their relaxing afternoon at the theatre would take a mysterious turn! The friends meet and team up with a talking goat called ‘King Bob the Second’ with a rather interesting back story! They then meet a scary yet friendly ghost, before encountering ‘Queen Beatrice’ - the stories Villain. Queen Beatrice is Bobs long lost sister on a mission to gain back the ‘invisibility pendant’ worn by Bob. The tale involves some moments of cast invisibility, some super comedy, and a dramatic ending, turning Queen Beatrice into a frog. The play was set in three different spaces at St Ninians keeping the audience on their toes by following the actors and the action, lots of fun! Utilising the space at St Ninians in this way, helped build the tension and suspense of the storyline, and created a real sense of set for the actors. This group of young actors demonstrated superb teamwork to present a polished performance. Again my congratulations to all involved, you should all be very proud of what you accomplished - I was a very proud teacher! I look forward to another creative and action-packed year of learning!